Obama and McCain on Climate Change: Who to Trust? Andy Revkin Tells You Who. This post got kind of overshadowed mid- writing by the Powell news today — but on the off chance that issue analysis still matters, Andrew Revkin has an important piece up at the NYT comparing Obama and McCain on climate change policy and expectations come next January. Obama, though (a) imperfect given the urgency of the situation or (b) politically realistic/pragmatic, depending on where you sit, is likely to offer real and significant policy change for the better. His opponent, for all that there are some vestiges left of the early 2000s McCain who did seem to take climate change seriously, is much less likely to do so — and he leads a party that remains much more opposed to real initiative in this area than the Democrats. Revkin conveys this impression as a good reporter should: by presenting what each candidate says, and then applying at least a first-order reality check to each claim. 1. As Revkin leads his piece, both candidates agree that climate change is real, human induced, and that the Bush adminstration has dropped the ball on the problem. 2. Both candidates claim support for a cap and trade bill that would control carbon emissions by setting permitted emissions totals and creating a market for permits to pollute within those limits. But even within the context of cap and trade, the difference between the two candidates policies are striking. The key distinction is that Obama would auction permits to pollute (in a manner roughly equivalent to other government auctions of common resources, like the electromagnetic spectrum or resource extraction licenses on public lands), while McCain would not. Unsurprisingly (at least to this observer), McCain’s position amounts to an enormous give-away to the polluting industries at the expense of the American taxpayer. Obama captures the wealth that the “resource” of carbon permits would command, enabling him to pay for his promised investment in non-polluting energy research and development and to offset the extra cost of goods and services that must now account for the carbon price with a tax and or deficit reduction. This all might be moot. Between the economic crisis and the fact that the American legislative process leaves a lot of room for folks like Sen. Inhofe to make mischief, a carbon market may still be a long way off. But the difference between the two policies is a telltale: McCain’s rhetoric seems environmentally friendly, but his approach is “dirty green” to use a phrase that Revkin quotes. McCain’s underlying policy thrust sees support of existing industry players as its primary driver. Obama is not completely innocent of such interest-group politics, but his approach is much cleaner – in the legislative sense as well as the green meaning of the term. Obama has offered what Revkin calls “muted” support for nukes, as well as for the McCain cure-all, expanded offshore drilling. But the essence of his approach is technological, running on two tracks: towards increased energy efficiency, and towards carbon-free technologies for producing energy. Most important, Obama has repeated stated recently that continuing to spend in these areas is essential in spite of — or really, good Keynsian that he is — because of the current financial crisis/recession. McCain, for all his lip service to the same ambitions has (a) the above-noted dismal legislative record here and (b) is committed to his hatchet — the spending freeze that will block any major new government initiatives for the forseeable future. Finally, no post about McCain and a research-centric area of policy would be complete without noting (a) that the broad anti-science theme of GOP-play-to-the-base politics makes it very unlikely that his administration will have the will of the individuals inside it to advance energy research outside the narrow confines of an oil/coal centric approach, and (b) that for all McCain’s stated commitment to increase science funding over his notional terms, the rest of his budget approach leaves no plausible way to do so and meet other commitments that are clearly higher priority for him: tax cuts targeted at the wealthiest and increased military spending. Remember the key number: the size of the deficits he is pledged to eliminate is roughly equal to the sum total of non-defense discretionary spending. For FY 2007, (the last year for which final figures are in) non-defense discretionary spending totalled $493 billion. The total deficit including both on and off-budget (think Iraq war supplemental appropriations…and look forward to bailout costs) has topped $500 billion each year since 2003. In that fiscal context, anyone who believes the McCain vague promise to increase federal support for science should take a look at this bridge in Brooklyn I have on offer. Same for any promises to take on an environmental problem that might actually cost money. 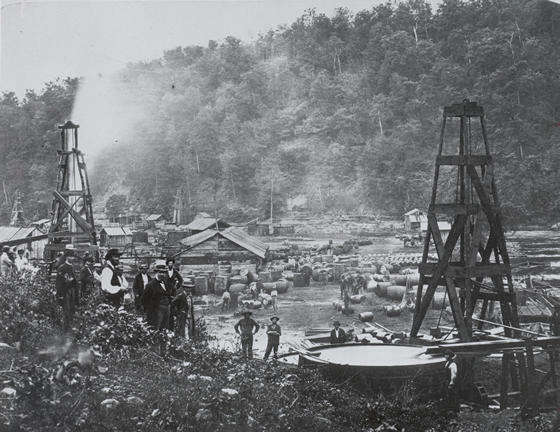 Image: The Phillips and the Woodford Oil Wells in Pennsylvania, 1862. Source: Wikimedia Commons. This entry was posted on October 19, 2008 at 11:56 am and is filed under climate, Climate follies, Energy follies, Environment, McCain, Obama, Politics, Republican knavery, Science Policy. You can subscribe via RSS 2.0 feed to this post's comments.